Make catering for family and friends easy! The Hearty British Feast is ideal for large buffet parties and includes the nation's two most loved cheeses! Please note we require at least a two day lead time for the Ham. Smoked Wiltshire Ham. Approx. 1.2kg - Produced from British pigs only and cured using traditional methods, this ham is smokey, moist and delicious. Baby Stilton Half PDO Approx. 1kg (pasteurised, vegetarian rennet). The King of British cheese! 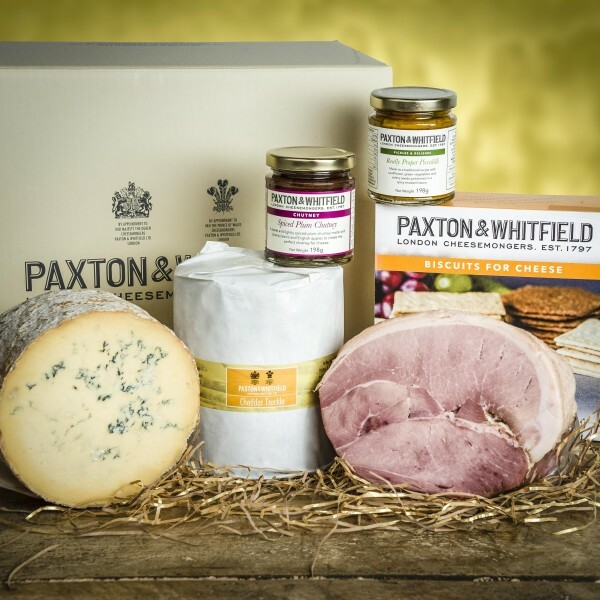 Our stilton is rich and creamy, with a herby tang. Cheddar Truckle PDO Approx 1.8kg (pasteurised, vegetarian rennet). A small cloth bound cheddar made for us in Dorset, then aged in caves for a distinctive, fruity flavour. Biscuits for Cheese Selection 250g. Contains our Cornish Buttermilk Biscuits, Original Crackers, Rosemary Wafers and Poppy & Linseed crackers, all made using the finest ingredients at an artisan bakery in Cornwall. Really Proper Piccalilli 198g. A truly chunky piccalilli made from cauliflower, red and green pepper, courgettes, tomatoes, cucumbers and onions, all preserved in a spicy mustard sauce. Spiced Plum Chutney 198g - A sweet and lightly spiced plum chutney from with plump raisins and English apples - perfect for cheese. Cooked and ready to eat. A smoked British ham. Lightly smoked to give an intense flavour. Boneless for easy carving. Please note we require at least a two day lead time for orders of this ham.